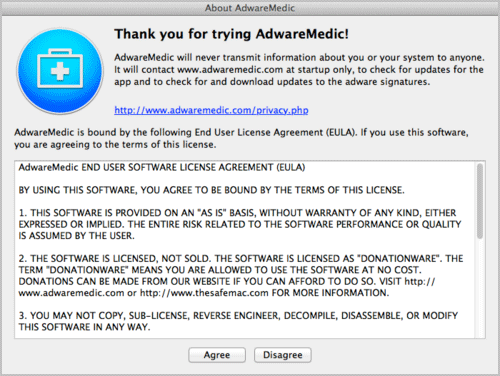 TSMART or AdwareMedic is an AppleScript program designed specifically to remove malicious programs from Mac systems. Use this program at your own risk. The author and this web site will not be liable for any damages or lost program that TSMART may cause. So far, there is no reported untoward incident when using TSMART to remove adware from the system. If TSMART removes programs or codes that you have intentionally installed, this is normal. Software like TSMART and any other security tools may falsely identify valid programs as a threat especially if it contains code that seems suspicious. As a precautionary measure, be sure to backup important data from your browser before running this tool. How to Download and Scan using TSMART? Disclaimer: By downloading and using this tool, you are considered to have read the owner’s disclaimer and agreed to terms and conditions as declared on the official web site. 1. Download TSMART from the official web page only. This product is now named Malwarebytes Anti-malware for Mac. Download the new software here. 2. After downloading TSMART.zip, open and run the file. 3. During initialization, this tool will check for any available update. 4. Next, will prompt to close all open browser application. 5. The tool will then proceed with the scan and start to look for adware or any suspicious programs on your computer. 6. All identified threats will be moved to Trash. Please review items from your Trash and delete adware related items. If TSMART accidentally deleted valid program, you can restore it as you wish.